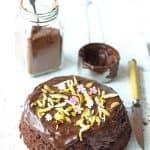 Looking for an easy microwave chocolate cake recipe? We have got one for you. This recipe is a saviour for those who want to bake a super moist, spongy and a rich chocolate cake in a microwave. Sift flour, baking powder, coffee powder and salt together in a large mixing bowl. Now add olive oil, eggs, vanilla essence and sugar. Mix nicely. Make sure no lumps or flour streaks remain in the cake batter. Do not mix the batter for too long. Pour lukewarm water and combine the cake batter once again to get a smooth consistency. Grease a round microwave-safe dish with a teaspoon of butter. Pour the prepared batter cake batter into the dish. Gently tap to pop any air bubbles. Cover the dish with a lid or cling foil. Microwave on full power (800 watts) for 5 minutes. Insert a skewer and check if the cake is cooked. If it comes out clean it is ready. Allow cake to stand for 5 minutes in the pan, then remove the cling film and turn out onto a cooling rack. Melt the chocolate in microwave on half power (600 watts) for approximately 2 minutes, stirring every 30 secs until melted. Add the cream and mix thoroughly until the ganache turns smooth and glossy. Spread the chocolate ganache over the cake only when it cools down to room temperature. Cut slices of microwave chocolate cake and serve.